RAID 5 is probably the most popular RAID setup in use today. It’s ability to perform well and its relatively inexpensive cost make it an appealing solution for providing data redundancy. The RAID 5 setup process will differ depending on the type of RAID chosen: software RAID or hardware RAID. There are numerous software RAID tools available for use. While Microsoft Windows started offering software RAID capabilities with Windows XP, the software for RAID 5 is only offered in the Windows Server operating system (version 2000 or later). Outside of Windows software solutions, there are other including the Linux operating system-based RAID tools. One caveat here is to be aware that the Linux tools have a hard time playing nicely with the Windows-based tools. The die-hard geeks will go with Linux based solutions because of their flexibility and cost, which is typically free since Linux is an open-source technology. Once you have decided to use a software or hardware based RAID 5 setup, the actual setup process can vary depending on a number of factors including: the software chosen and/or the capabilities of the hardware installed. You will need to consult the documentation accompanying the relevant solution chosen. Software-based solutions will likely contain context-based help and will usually have resources online available for you to consult. Hardware-based solutions will typically have a setup and configuration process which can be accessed through system settings and/or BIOS menus. It was once true that software-based RAID solutions were considered not as optimal as hardware-based solutions, and that was mainly because they were deemed slower. With modern processing power, this has become less and less of a factor and most software-based solutions to a RAID 5 setup are completely viable. Hardware-based RAID 5 will require your server to have a RAID controller installed. More often than not, most PC’s and servers have already these built in these days. If not, it’s easy enough to obtain a RAID controller card which you can slip into an unused PCI or SATA slot. Just be sure you have an extra slot available before buying a controller card. 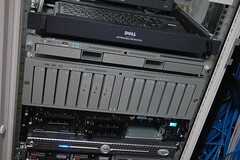 The other hardware required, whether running a software RAID 5 setup or a hardware RAID 5 setup is three or more hard drives. Ideally the drives will be of the same size, model, and make. Keeping them all the same helps prevent problems during setup and while they are running in production. Because of the hard drive requirement, running a RAID 5 setup on the typical consumer PC can become difficult due to limitations on space in most modern PC cases. It easily becomes necessary to use a server hardware setup of some sort. Once you have decided to use a software or hardware based RAID 5 setup, the actual setup process can vary depending on a number of factors including: the software chosen and/or the capabilities of the hardware installed. You will need to consult the documentation accompanying the relevant solution chosen. Software-based solutions will likely contain context-based help and will usually have resources online available for you to consult. Hardware-based solutions will typically have a setup and configuration process which can be accessed through system settings and/or BIOS menus.